The VacuMaid GV50PRO is a quality vacuum designed for a garage owner that’s passionate about his tools and keeping his workspace clean. Thanks to its tailored features, this vacuum cleaner is perfect for cleaning everything in your garage and car. The best part is that it’s compact and highly portable which is more than what you would expect from a conventional garage vac. You’d think that because it has to handle difficult messes like sawdust and screws that a garage vacuum would come in the form of a heavy and bulky unit. But, the VacuMaid GV50PRO proves this misconception wrong by providing a lightweight yet powerful cleaning solution. If you’re interested in this vacuum but you would like more information about it before you make a purchase, you’ve come to the right place. You’re making a smart decision by doing your research before you invest in this vacuum and we appreciate that. That’s why we put together a comprehensive guide with all the information you need to know about the VacuMaid GV50PRO. Read on for more. Why You Should Buy a Mounted Garage Vacuum? I know a mechanic who loves his job so much that even on holidays or days off he spends time in his garage tinkering at his car or fixing one of his tools. You may not be a mechanic, but if you’re as passionate about working in your garage as this guy, then you deserve an all-encompassing vacuum to keep your space clean and inspiring. First off, the VacuMaid GV50PRO is a wall-mounted unit, which means that it’s easy to store and access whenever you need it. It’s versatile enough to clean up garage surfaces as well as the interior of your car so that both spaces are always spotless. You can use it to instantly scoop up sawdust, sanding and other messes generated by your garage projects. It’s important to clean up after each project if you want to keep your garage well organized at all times, and the type of vacuum you opt for will depend on your needs and the type of projects you like. For instance, if you only need a vacuum to clean up dry messes then you should opt for a single-function vac. But, if you know that you’re a bit clumsy and you are prone to spilling drinks and other liquids in the garage, then you’ll have to opt for a vacuum that has dry/wet cleaning capabilities. A vacuum like VacuMaid GV50PRO ticks all the boxes. In addition to cleaning up wet and dry messes, it has a powerful filter that can help you keep allergies at bay by purifying the air. 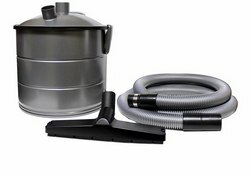 What’s a Good Mounted Garage Vacuum? You want a vacuum so that you can clean the messes you make in the garage, right? That’s the most important thing to keep in mind when looking for a wall-mounted garage vacuum because that’s the only thing that matters. Extra attachments and cutting-edge features are nice, but you want a vacuum that takes care of the basics first, and that means the ability to handle all the different messes that one can generate in a garage, from sawdust to liquids. Keep in mind that not all vacuum cleaners are made equal. Some are large and hefty which means they come with a large storage capacity, but they’re often difficult to use and may need a sturdier bracket to mount. You should also consider whether or not the vacuum comes with a single-use bag, a reusable bag or a tank. It’s always best to opt for the latter two options because replacing the bag after each use can get tiring. Meanwhile, a reusable bag or tank only requires that you dump the dirt afterward and replace it back to the vacuum for another round of cleaning. Also, most vacuum cleaners nowadays come with a built-in filtration system which means you may have to replace the filters regularly. However, there are also lifetime filters and self-cleaning filters out there that make your life easier. So, consider this if you’re someone who values the convenience of being able to use the same filter throughout the vacuum’s lifespan. Now that you know what to expect and look for in a vacuum, let’s take a look at what the VacuMaid GV50PRO has to offer in terms of features and capabilities. At 50-feet long, VacuMaid GV50PRO’s hose gives you quite a lot of leeway and reach. It’s perfect for large double or triple car garages, and it’ll make it easier for you to clean up to two cars without moving them. This feature solves a common problem among garage vacuum users because in the past you’d have to move each car closer to the wall-mounted vacuum in order to clean it. But thanks to VacuMaid’s long hose, you don’t have to worry about that. Despite its long hose, this vacuum offers impressive suction. It simply gobbles up the dirt quickly and effectively. This is all thanks to its powerful 5.7-inch motor which makes this vacuum ideal for use in the garage, basement and of course on your car as well. The VacuMaid GV50PRO pulls the dirt out the first time so you don’t have to vacuum the same spot multiple times. All in all, VacuMaid didn’t compromise when it comes to the suction power in this model. The VacuMaid GV50PRO comes with a wide array of different tools designed to make it easier for you to clean different surfaces. There’s an attachment for each cleaning function, including carpets, upholstery, the car dashboard etc. For instance, the crevice tool is designed to keep the area between the seats and backrest spotless, while the brush tool is perfect for cleaning the dashboard. There’s also a dedicated upholstery nozzle for the seats. This assortment of tools makes for versatile functionality and is guaranteed to save you time and money. You’ll be glad to know that this unit is equipped with a HEPA-approved collection filter bag. This means that the filter can trap fine dust and clean up the air in your garage so that it’s free from allergy causing dust particles. Without the accumulation of dust, your garage surfaces stay cleaner for longer. All you have to do is dump out the dirt whenever it’s full to protect your motor from dust accumulation. The only downside is that you have to purchase and replace the filter bags regularly but it’s well worth the money when you consider how clean your garage will be. The VacuMaid GV50PRO is incredibly easy to mount. So long as you have some screwdrivers and a drill it should be up in just 10 minutes. That’s because it comes equipped with a convenient bracket that allows you to hang the unit neatly in your garage while leaving enough space for your other tools and garage toys. Plus, the bracket is secure enough for you to use the vacuum while it’s mounted without tipping it over. And, it’s just easier to access a vacuum that’s mounted on the wall than a unit that you have to pull out from under a sink or cupboard. At first glance, the compact design of this unit makes it look more like a garden watering tool than a vacuum cleaner. Don’t let its simple and low-profile design fool you though. This vac boasts a strong motor that’s responsible for its effective suction power. It can clean both dry and wet messes, and since it has a capacity of only 4 gallons, emptying it is extremely easy. Furthermore, this vacuum is made of powder-coated galvanized steel that’s resistant to corrosion. This means it can handle the rigors of garage use and will last you for many years to come. Other notable features on this vacuum include a 30-ft. hose, integrated blower function, and an easy-to-mount bracket. The VacuMaid GV30 Wall Mounted Garage Vacuum is a joy to work with because it comes with all the features you’d expect from a quality vacuum. 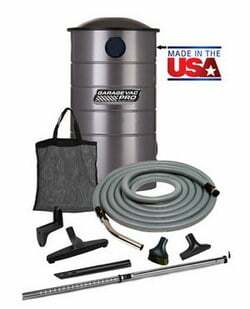 This includes a 30-ft. hose, a 5-layer HEPA style bag that eliminates the need for filter-cleaning, 7 gallons of space and powder-coated steel construction. This is in addition to the tools and attachments that it comes with which include a dusting brush, telescopic wand, crevice tools, floor tools, a hanger and a caddy bag. That’s everything you need to get the most out of your vacuum for many years to come. Although it comes at a higher price tag than most other models, it’s totally worth it when you consider the level of quality and performance that it offers. Co-founder of "Cleaners Expert" website (cleanersexpert.com). I like to test different devices. I'm glad if the results of my tests will be useful to someone.